1. What is the purpose of this fax? 2. How many items were incorrect? 3. 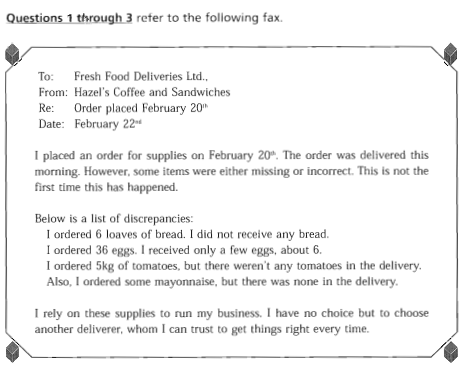 What will be the result of this fax? B. The writer will use a different delivery company. C. The writer will close her business. D. The writer will receive some money back. 4. What do these machines provide? 5. What makes these machines successful? A. They are used only in businesses. B. People can use them any time. C. The cashiers are very friendly. D. You can eat there. 6. How do these machines save companies money? A. They are found in business buildings. B. There is no need for cashiers. D. Workers don’t have time to eat. 7. 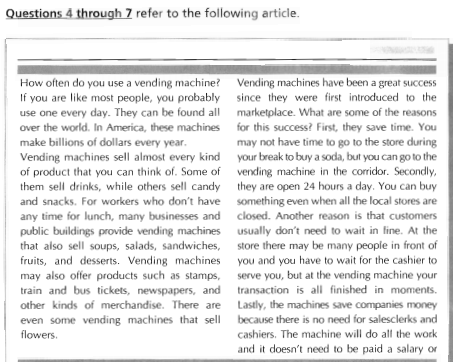 Which of the following is NOT mentioned as something you can buy from a vending machine? 8. How many days will this special offer last? 9. What is the weekend special offer? A. There is no special offer. B. 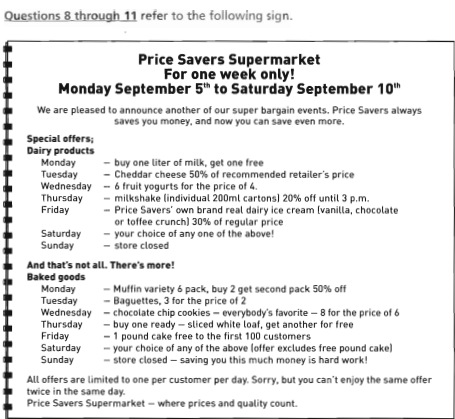 Customers can choose the offer they prefer. C. Customers can choose free fruit and vegetables. D. It does not say. 10. How many customers can receive a free cake? 11. How many times can one customer take advantage of each offer? A. As many times as he or she wants. D. Customers cannot take advantage of each offer. 12. Who took part in this survey? 13. How many people chose green tea as their favorite flavor? 14. 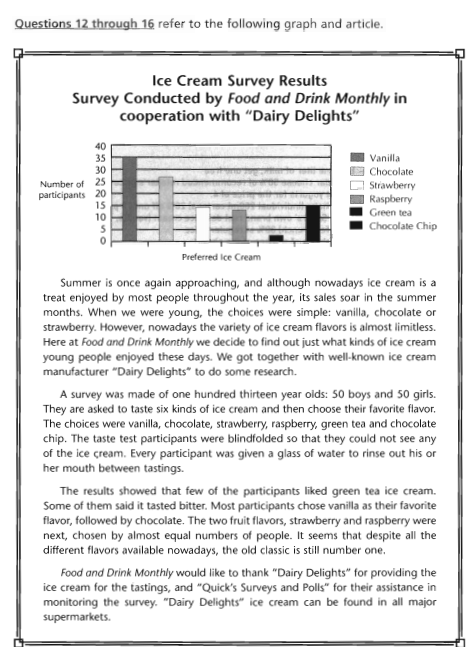 Which two flavors were chosen by most participants? 16. Where can you buy “Dairy Delights” ice cream? A. It is not for sale.